It probably doesn’t need stating, but Breaking Bad is omnipresent in popular culture at the moment. Although initially a sleeper hit, over the course of its broadcast life, its tale of a chemistry teacher gone rogue took on a life of its own, becoming a brand as much as a television show; complete with its own mugs, posters, and pyjamas, all plastered with quotes and put up for sale on any given high street. By this point, you would be hard pressed to find anyone who wasn’t aware of the show’s enduring presence on the cultural radar, if just through osmosis. As far as I’m concerned, this isn’t without good reason. Equal parts De Palma, Shakespeare, and Moe Howard, Breaking Bad was meticulously crafted throughout the entirety its five series run, and deviously aware of the strengths of episodic entertainment. The show’s odd blend of high-drama and farcical comedy, combined with a tendency towards last-minute cliffhangers, ensured that many, including myself, just couldn’t quite bring themselves to stop talking about it. In spite of its blanket-coverage of everything, ever, however, there’s still a lot about the show that has gone unmentioned. Consider, for example, the inverse relationship between its lead anti-hero, Walter White, and his sleazy comic-relief lawyer, Saul Goodman. As the show neared its end, White gradually transitioned into a cartoonish villain, more metaphor than man. Saul, however, took on a surprising life of his own, arguably becoming one of the show’s primary emotional anchors. While White spun into increasingly convoluted Machiavellian constructions, Goodman began to shoulder the bulk of the show’s connections with the realistic Albuquerque in which it forged its appeal; grounding it in some semblance of believable drama while the body count steadily rose. Far from his beginnings as an ancillary joke, episode by episode, he became one of the show’s strongest characters. For me, this is why—for any humming and hawing about the future of Breaking Bad as a franchise—there’s no doubt that Saul was the right pick for the show’s first spin-off, Better Call Saul. Taking place a few years before the start of Breaking Bad (when ‘Saul Goodman’ was better known by his birth-name Jimmy McGill), Better Call Saul builds on the upward trajectory of Goodman’s character development in Breaking Bad, detailing his journey from lowly court-appointed suit to a bona-fide crooked businessman. Perhaps the most notable feature of Better Call Saul’s first episode is its insistence on being appreciated on its own terms. 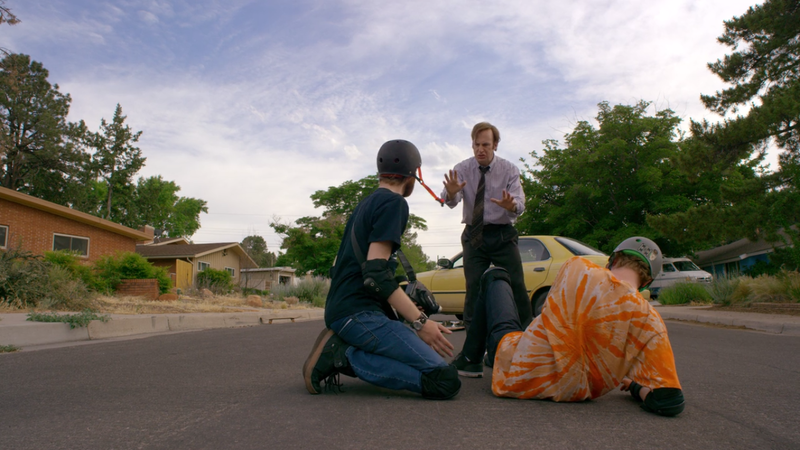 Besides a few nods to prior characters and locations, it provides a self-contained story, placing Saul Goodman/Jimmy McGill in circumstances largely unfamiliar to any viewing of Breaking Bad. Walter White’s story placed the majority of its dramatic beats on issues of life and death; Jimmy’s are merely on matters of reputation, and although this introduction might lack for Saul’s trademark ‘comic’ moments, it finds a distinctive humour in the pathetic circumstances of its protagonist’s life. Show-runner Vince Gilligan’s approach to drama is warped by focusing on a character like McGill. Scenes that would otherwise be treated as sincere outpourings become tragicomic exercises in irony, and it places the show within a unique tonal space. The show’s opening, in particular, provides a frame story that emphasises this warped tone. 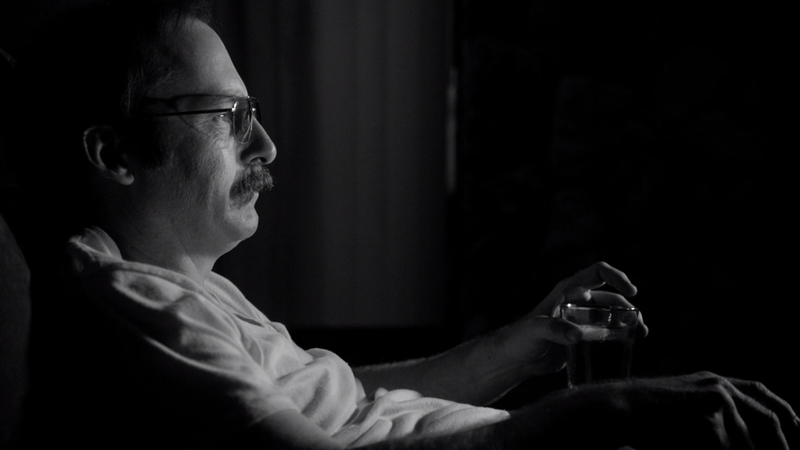 Towards the end of his tenure on Breaking Bad, a beaten and distraught Saul Goodman questions his future, stating, “if I’m lucky, in a month from now, best case scenario, I’m managing a Cinnabon in Omaha”, which is exactly where we find him in an extended black-and-white sequence at the beginning of Better Call Saul. It’s a long overdue piece of closure on the character as we saw him on Breaking Bad, and a bittersweet resolution to his tale (if it is, in fact, a true resolution: I don’t doubt that Gilligan has a long-term plan for the series that may or may not extend to the present day). Fearing reprimand for his prior life as a criminal lawyer (with the emphasis—per his introduction on Breaking Bad—on criminal), the older McGill is seen as a neurotic, fearful, and dramatically pitiable character, an ungroomed and disillusioned schmuck just as grey as the photography that captures him. We’re only taken back in time when McGill pulls out a VHS tape of his old advertisements to reminisce, setting up the show as the saccharine reflections of an embittered has-been. In itself, this offers the show a lot of possibilities, and places it in some interesting circumstances. Visually, the nostalgic frame has offered the show a high-contrast, hyper-saturated visual style, showing us a life filtered through remembered commercials and Polaroids, and it provides a welcome change from Breaking Bad’s muted browns and greens, while simultaneously conveying the shows ironic roots in the underside of the American dream. Thematically, it also provides an extension to Breaking Bad’s overarching theme of personal liberation. A particularly effective shot sees a blurry Goodman slowly come into focus in the illumination of his old advertisements, and the extent to which he has lost personal definition in the wake of his downfall should continue to offer reflection as the show goes on. Saul Goodman’s monochrome future provides a tragic alternative to Walter White’s bow-tied ending, one that will be easier to parse once McGill’s rise has been more comprehensively charted. If Better Call Saul’s first episode promises anything, it’s chaos, to counter the perfectly ordered, classical plotting of Breaking Bad. 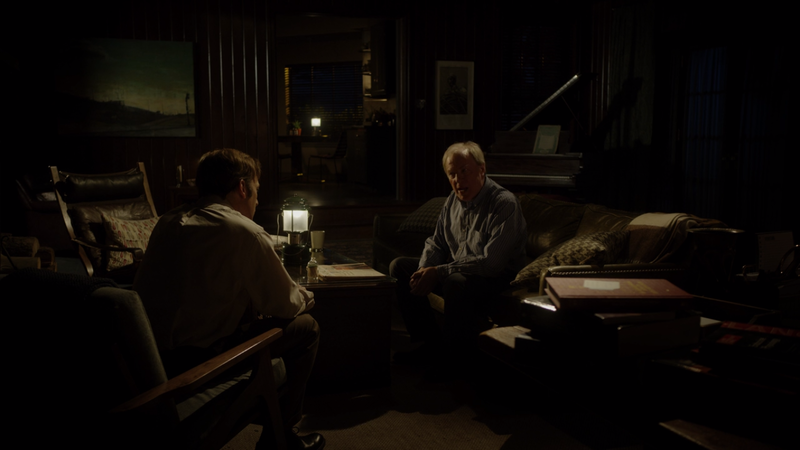 While the two shows seem to share a number of the same themes, Better Call Saul seems intentionally less disciplined, reveling in the noir-esque confluence of divergent people and places, as if to reflect the dysfunctional appearance of McGill himself. By the end of this episode, McGill’s plans are already going awry, and his fortunes don’t seem set to improve any time soon, in stark contrast to the persistent dramatic luck of White. If initial appearances are anything to go by, Better Call Saul will be a deconstruction of Breaking Bad just as much as it is a companion. The apple doesn’t fall too far from the tree, of course. The episode’s decision to close with a gun pointed at McGill is a reminder that despite its ironic presentation, this is still a Breaking Bad property, one that will no doubt share that show’s propensity for unsettling acts of violence and gross indifference. Its arrival rounds the first episode off perfectly, shooting us on a welcome trajectory from the unknown courtroom drama of McGill’s formative years, back into the familiarly dangerous criminal underbelly of Breaking Bad. 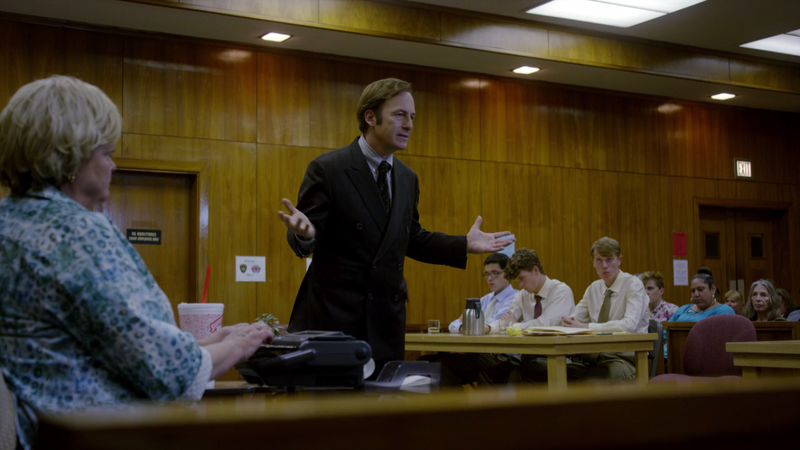 Nestled between new and old, Better Call Saul’s first step has landed perfectly in the place of a great spin-off. This entry was posted in TV and tagged Better Call Saul, Bob Odenkirk, Breaking Bad, Episode One, review, Saul Goodman, Vince Gilligan, Walter White. Bookmark the permalink.